For two years a ring of thieves targeted businesses in small communities stretching from Edmonton northeast to Cold Lake. 'What is left behind is a visible scar which shakes the sense of public safety"
For two years, the thieves targeted businesses in small communities stretching from Edmonton northeast to Cold Lake, breaking into businesses, trafficking guns -- and stealing ATM machines. They hit towns like Lamont, Mundare, Goodfish Lake and Saddle Lake, place names that hardly jump from the Alberta map, where convenience stores and community banks are neighbourhood institutions. In the first six months of 2016, thieves targeted more than 130 ATM machines in 60 communities. Banks, credit unions, gas stations, and convenience stores were all targeted. Police announced on Tuesday they busted seven suspects believed to be part of two organized theft rings. The group racked up over 100 charges, ranging from vehicle theft to firearms trafficking. They are believed to be involved in six ATM heists. And while businesses in the communities targeted by the thieves were thankful for the arrests, they say they certainly don't feel more secure. Lance Cardinal, who owns the Cardinal Cash and Carry in Goodfish Lake, 175 kilometres northeast of Edmonton, saw his turn come in the middle of a January night. His security camera caught three suspects wearing balaclavas and coveralls, breaking into his store, before getting down to the business of removing the store's two ATMs. One of the men as carrying a long gun. They wrapped the ATMs in tie straps, attached them to a chain from a vehicle and ripped the ATMs from their place. "They came in and yanked out two ATMs that were installed and bolted down to the floor infrastructure," Cardinal said on Tuesday, after police announced the arrests. But when Cardinal showed up at the store, his bad luck was only beginning. With the store's walls, counters and doors extensively damaged, he called his insurance company for help. "When we told them about what occurred they gave us the fine print and told us there was nothing they could do because it's read in as vandalism to the building." Vandalism is not covered by his policy, he was told. He estimates the damage will cost him more than $5,000. He thought, he would get rid of the ATMs, to make sure he wasn't targeted again. But the company who owns the ATMs told him that wasn't an option. "Their only concern being is to replace the ATMs into the building again, which I don't agree with. "Seemingly we're signed into an agreement that they are to be replacing the ATMs. Otherwise it's going to cost us to pay out those ATMs for the x amount of years that we signed the contract agreement for." That comes out to $36,000, he said. Cardinal doesn't know what he'll do now. "There's not too much as a business owner that I can do in regards to security rather than having an alarm and cameras all over the place. "Evidently it's not slowing these people down." RCMP and ALERT conducted a five month investigation into a a wave of ATM thefts that have plagued the province since the start of 2016. 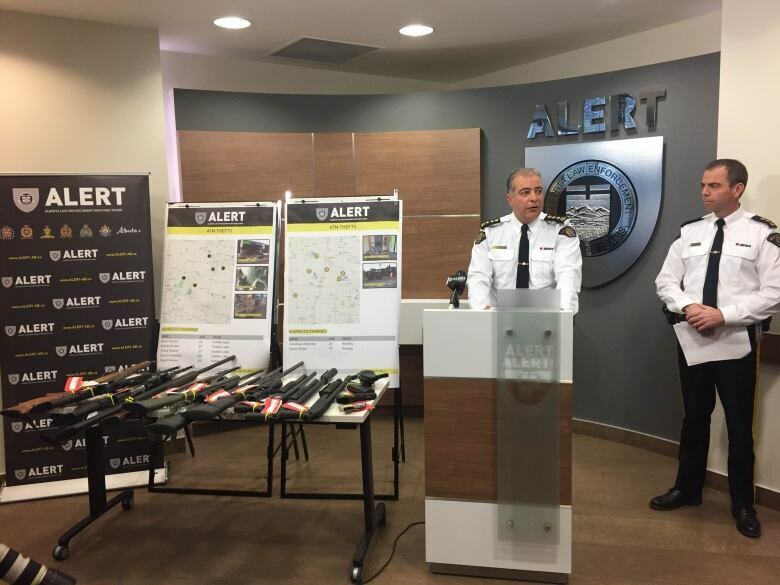 The arrests announced on Tuesday were part of a five-month joint investigation between RCMP and the Alberta Law Enforcement Response Team. Staff Sgt. Dave Knibbs from ALERT said the crimes targeted the hearts of various communities. "These groups consistently targeted small-town Alberta," he said. "They terrorized rural communities and left behind a trail of destruction...If we consider the personal cost, this is a destroyed business, or a destroyed workplace. In small communities, these banks are neighbourhood institutions, and what is left behind is a visible scar which shakes the sense of public safety." The six men and one woman who were arrested are from Rimbey and Saddle Lake.